The unregulated sale and transfer of weapons harms the poor and threatens peace and security around the world. That is what Archbishop Francis A. Chullikatt, right, the Holy See’s permanent observer at the United Nations, said to a committee preparing for the July U.N. Conference on the Arms Trade Treaty on Feb. 13. 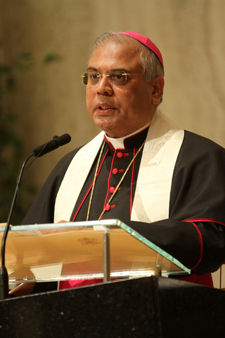 Archbishop Chullikatt said the Vatican believes the aims of the arms treaty should not be only regulating the sale of conventional weapons, but also “the disarming of the international illicit market.” The treaty should include small arms and light weapons, which are easy to access on the black market and harm hundreds of thousands of people each year. It should spell out the threats to human rights, humanitarian law and development posed by illegal weapons sales; reinforce international cooperation and assistance; include provisions for assisting victims of the illegal weapons trade; and be flexible enough to cover emerging weapons technologies. This article also appeared in print, under the headline "Containing Arms Sales," in the March 19, 2012 issue.